Check out our guide to find holiday markets popping up near you in Philadelphia. Photograph by Russ Brown Photography. For holiday shopping with an international flavor, stop by the redesigned Love Park between now and Christmas Eve. In addition to the beer garden, the mulled wine booths and the many vendors selling German trinkets, Dutch treats, etc., there’s also a packed calendar of events including live music, dance performances and dog-friendly Fridays. Through December 24, LOVE Park, 1599 John F. Kennedy Blvd. Just catty-corner to the Christmas Village is the Made in Philadelphia Holiday Market in Dilworth Park. The focus, of course, is on items made by local shops and artisans (including Franklin’s Garage, Camino Books, Accent Aroma, Jonesy’s Accessories and tons more; here’s the full list). While you’re there, why not do a little ice skating or ice sledding? 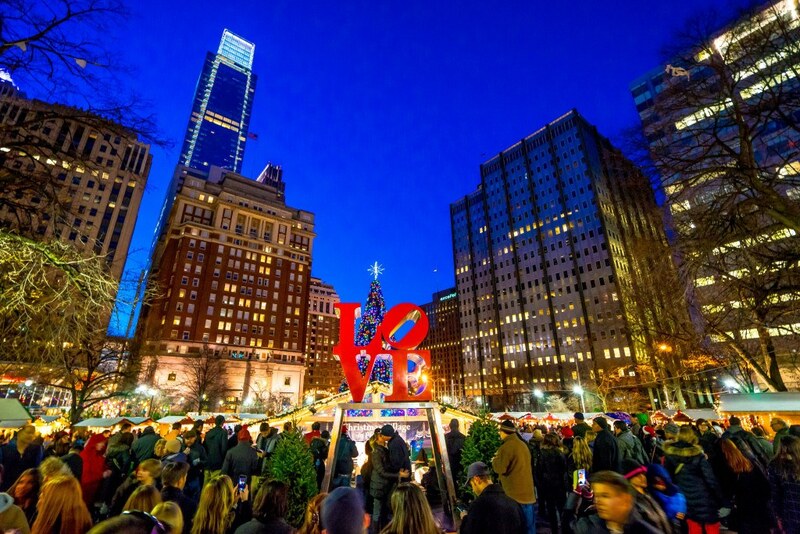 Runs through January 1, Dilworth Park, 1 S. 15th St.
Thursdays: Holiday Strolls — themed promos, happy hour specials and more. December 1: Style Me Manayunk — a “retail pop-up” with food, music and vendors selling fashion, home décor and other gifts and such, at the Nickels Building, 4323 Main St.
December 8: Rudolph Run — a 3-mile run with holiday attire encouraged. New Hope’s cozy enclave of shops was made for holiday shopping. Expect gingerbread houses, murder mystery dinner theater, photos with Santa and more. Here’s the calendar. Through January 5, 2019, 2400 Street Rd., New Hope, PA.
One weekends between now and Christmas, a little patch of North Second Street will host a pop-up holiday market. Vendors include Fezziwig’s Sweet Shoppe, the Clay Studio, Petit Jardin en Ville and other cool stuff from the neighborhood. For more Old City holiday stuff, check this. Saturdays & Sundays, 11 a.m.-7 p.m., through December 23, 137 N. Second St.
Housekeeping accessories, kitchen stuff, “urban homesteading supplies,” trees, gardening gear, more. Friday-Sunday, 10 a.m.-6 p.m., through December 30, 542 Carpenter Lane. Trees, ornaments, decorations and such. November 23-December 24, Cherry Street Pier, 121 N. Columbus Blvd. The Kensington salvage company sells new and used holiday decorations and such. Saturday and Sunday, November 24 & 25, 2441 Frankford Ave.
New Kensington Community Development Corporation hosts local makers of beer, art, candles and more. Saturday, November 24, 10 a.m.-4 p.m., 1825 Frankford Ave.
Vintage clothing, toys, records, etc. Canned good donations for Philabundance welcome. Sunday, November 25, 10 a.m.- 4 p.m., Keystone Mini Golf and Arcade, 161 Cecil B. Moore Ave.
Shops stay open late; hot chocolate, wine tastings, carolers and more. Wednesday nights, November 28-December 19, 6-9 p.m., along Germantown Avenue. Open-air sale and festivities in downtown Ardmore. Friday, November 30, 5-9 p.m. & Saturday, December 1, 10 a.m.-4 p.m., Cricket Avenue, Ardmore, PA.
Raffles, white elephant and more in a Fishtown church. Saturday, December 1, 11 a.m.-7 p.m., Holy Name of Jesus Church, 701 Gaul St. Decorated and undecorated wreaths, centerpieces, ornamental greens, more. Saturday, December 1, 10 a.m.-4 p.m., Bartram’s Garden, 5400 Lindbergh Blvd. Swedish food, crafts, decorations and more. Saturday, December 1, 11 a.m.-4 p.m., American Swedish Historical Museum, 1900 Pattison Ave. Some 75+ local vendors selling jewelry, art, textiles and other curiosities. Saturday & Sunday, December 1-2, 11 a.m.-5 p.m., Pennsylvania Academy of the Fine Arts, 128 N. Broad St.
Silent auction, raffles, “reindeer pony rides,” “holiday photos with Santa and his horse,” more. Benefits Riding Lesson Scholarship Fund. Saturday, December 1, 10 a.m.-3 p.m., 120 W. Northwestern Ave.
Greenery, hot sauce, candles, you name it. December 1, 2, 8 & 9, 10 a.m.–4 p.m., 2501 E. Cumberland St.
Arts and crafts, live music, tree lighting, etc. in the Northeast. Sunday, December 2, 2-6 p.m., Ryan & Cottman avenues. Local vendors selling clothes, ornaments, art, more. Sunday, December 2, 11 a.m.-3 p.m., 1216 Chestnut St.
Glass, housewares, wearables and lots more. See the artists’ studios as well. Saturday, December 8, 11 a.m.-6 p.m., 1241 Carpenter St.
Ceramics, textiles, jewelry, paper and more by 80+ local artists and craftspeople. Saturday, December 8, 11 a.m.-5 p.m., Bok, 1901 S. Ninth St.
Saturday & Sunday, December 8 & 9, 11 a.m.-5 p.m., Cherry Street Pier, 121 N. Columbus Blvd. Saturday & Sunday, December 8 & 9, noon-6 p.m., 7054 Germantown Ave.
Saturday, December 8, noon-4 p.m., 1219 Vine St.
Wares by local vendors, s’mores, pet adoption opportunities, etc. ; get your pic with local celebrity Oliver the Love Pug and/or a dog Santa. Sunday, December 9, 1-8 p.m., Warehouse on Watts, 923 N. Watts St.
Vintage clothes, records, “old punk junk” and more. Friday, December 14, 4-10 p.m.; Saturday & Sunday, December 15 & 16, 10 a.m.-5 p.m., Bok, 1901 S. Ninth St. Items by queer artists and crafters. Saturday, December 15, 1-6 p.m., William Way LGBT Community Center, 1315 Spruce St.